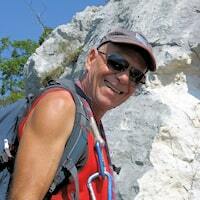 Proposal of Mountaineering School Arco Lake Garda for a 4 days trip from hut to hut. Hiking the Brenta Dolomites Italy from the South to the North "On the tracks of the bears"
Map of our 4 days trips from the South to the North hiking from lodge to lodge / from hut to hut. For 30 years our mountain guides school has accompanied friends and customers in the Dolomites on guided hikes or via ferrata routes (the famous Via delle Bocchette) from lodge to lodge or hut to hut. So far we had never used the "Trade Mark Brenta Trek" until in the year 2009 our marketing experts in Trentino decided that every hike in the Brenta Group should be named Brenta trek. Our alpine guides school has many offers for rock climbing, mountaineering, high mountains crossing and via ferratas in the Brenta Dolomites (see our website www.via-ferrata.co.uk ). With our proposal of the Brenta Trek, we would like to offer a 4 day guided hikes from lodge to lodge crossing from the South to the North, the entire Brenta Group, suitable for everybody. The participants only need to have a good physical condition and some experience in the mountains. 3. taxi from Madonna di Campiglio to San Lorenzo in Banale. Please consider the low number of participants because with only 4 people the guide has the possibility to take care of everybody personally. The rate can reduced only for preformed groups of min. 5 max 7 people with certain hut to hut experience. Three days holidays on the via ferratas in the Italian Dolomites Alps Europe by Mountaineering Guides Arco Trentino at Lake Garda. Four days advanced course on the famous via ferrata delle Bocchette with overnight stay in mountain lodge Trentino. Mountaineering School Arco Lake Garda suggest the guided crossing of Brenta Dolomites on the via ferrata Bocchette di Brenta in the Alps Europe. 3 or 5 days hut to hut across beautiful multicolor walls with overnight stay in the mountain lodges. 1st day - The meeting point can be at your hotel at Lake Garda and then we will drive on with the minivan of our mountain guide. There is also the possibility to meet directly in San Lorenzo in Banale (other possible meeting points to be agreed upon with the participants). From San Lorenzo the guided trip leads us through a canyon on a comfortable forest road which can also be used by jeeps. After an hour the valley is getting wider with colorful meadows, alpine environment and many animals. Here is the empire of the chamois and marmots, eagles and only recently ibex have been spotted again. In about three hours we reach Rifugio al Cacciatore (hunters hut) where the food is still excellent even if now there are no more hunters. The guided hikes continues after a snack and in two hours we reach Rifugio Agostini. 2nd day - Around 8 am in the morning we start from Rifugio Agostini and we hike on the Sentiero Palmieri which is flat at the beginning. After an hour we encounter the first steep slope of the tour. Then we move on to the Forcolotta di Noghera (Forcolotta means pass). Here we take a break to enjoy the panoramic view of the entire mountain group. The panorama extends to the Lake Molveno and later we descend on a serpentine path which ends up on a huge flat meadow adjacent to the majestic wall of the Cima Tosa. We turn right towards Rifugio Pedrotti alla Tosa (cappuccino or pastasciutta?) and in a quarter of an hour we reach the famous Bocca di Brenta. Here we are in the heart of the Dolomites and on the top of our trip. In the Middle Ages some witches used to live here and the local shepherds and hunters went to ask the for good luck and we are doing the same now! From here begins the "most difficult" line of the treks: descent from the Bocca on a snowfield of which only the first 20 meters are steep. Then the trail is leading further downwards between rocks and equipped with cable until we reach a flat snowfield. From here we can admire the famous Campanile basso and perhaps also the rock climbers on the walls of this fantastic pillar. In an hour easy path we reach our destination of the 2nd day which is Rifugio Brentei. 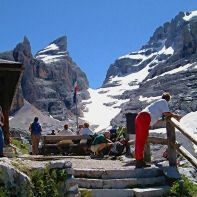 If the afternoon is boring for you, we may reach Rifugio Alimonta, the highest mountain Lodge in the Group. 3rd day - From the Rifugio Brentei our path leads us slightly downhill on the most famous trail of the Brenta Dolomites: the Bogani Path. 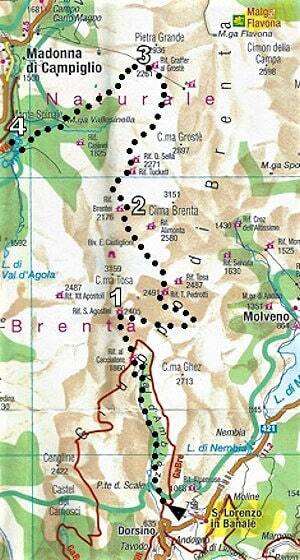 In an hour of walking you reach the junction that leads to the left at Rifugio Casinei. Instead we climb to the right a comfortable path towards the Rifugio Tukkett and suddenly we see the towers of Castelletto. In about an hour we reach Rifugio Tuckett which is usually crowded with tourists - but not at this time. We can easily stop for a capuccino and a good piece of cake and then continue on the path up and down, towards the Passo del Groste '. At the end, slightly downhill, in about two hours we reach Rifugio Graffer al Groste ' . Here there will be many tourists and even "mountain bikers" but civilization, after three hard days of hiking, also has its advantages shower, good food, selection of wines. 4th day - After a rich breakfast we depart from Rifugio Graffer at 8.30 in the morning. On an easy zigzag path we go downhill to Vallesinella Valley "On the tracks of the bears". Unfortunately we cannot see any bears since this species is only nocturnal but fresh tracks and deep scratches on the trees are very impressive. On a path through a wild valley with many bear caves, we reach Malga Vallesinella. We descend along a canyon where there are the most beautiful waterfalls in the Dolomites. The trail is well equipped with bridges and stairs and allows spectacular photos. At the end a flat forest road leads to the new Rifugio Vallesinella where we can have lunch and wait for the arrival of the taxi that brings us back to S. Lorenzo in Banale. This last day consists of a long descent. The hiking time depends a lot on the resistance of the knees and the stops (4/5 hours). In any case there will be the certainty of memories that will accompany us forever. Delio' s home is in the walls and routes of the Dolomites. He knows many climbing walls in the world but he is still proceeding on our trip with the same passion and reverence like he did as a child with his father who had introduced him into the world of forests, rock towers and animals. 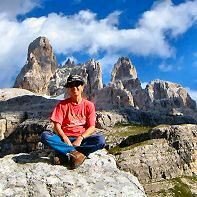 Delio can explain to you the history of every rock or plant in the mountain group and he would like to pass on to you the his own mountain experience and passion for nature. What to bring with you: you must have solid boots (NO SNEAKERS) and a rucksack (50 liter). You will get a complete list of what to bring at the time of your reservation). How you have to book and request information: only by e-mail at least 30 days before the start of the tour. Program changes: upon your request we can modify the route through the Via ferrata delle Bocchette in the same Dolomites mountain group. WELCOME TO OUR HUT TO HUT DOLOMITES! Many times we are receiving requests from people who would like to go on the excursion without other participants (just in 2 people with their partner or a friend) or with special requirements regarding the program of the tour. This proposal is also dedicated to all those who are not able to match their dates with our calendar dates of the excursions due to work or holidays. The program of the individual guided hut to hut is the same as the normal program of our trip with the option to changes upon request of the customer. - taxi rate from Madonna di Campiglio to San Lorenzo in Banale.